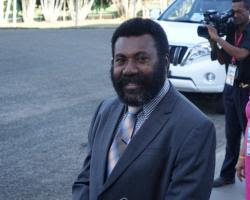 PANGU Party has caused the biggest election upset in Morobe Province by ousting ruling party members, including Papua New Guinea Speaker of Parliament Theodore Zurenuoc, Fisheries Minister Mao Zeming, Housing Minister Paul Isikiel and Benjamin Philip. And Pangu diehards are partying in Lae City in victory celebrations. Post-Courier Lae Bureau says the city came to a standstill as supporters, young and old, shed tears of joy, for Pangu’s reinvigoration of Morobe, long regarded as the party’s birthplace. Pangu party leader Sam Basil arrived by helicopter to join Markham member-elect Koni Iguan and Tewae Siassi member-elect, Dr Kobby Bomorea. Pangu Party ousted Minister Isikiel in Markham Open, Speaker Theo Zurenuoc in Finschhafen, Deputy People’s National Congress (PNC) leader and Fisheries Minister Mao Zeming in Tewai-Siassi and MP Philip in Menyamya. The victorious Pangu members are Dr Bomorea (Tewae-Siassi), Thomas Pelika (Menyamya), Renbo Paita (Finschhafen) and Party leader Sam Basil for Bulolo. Only Kabwum Open was won by Christian Democratic Party’s (CDP) Patrick Basa. Counting is continuing in the four remaining seats. Ross Seymour (National Alliance) is leading in Huon Gulf, Samson Timson (PPP) is ahead in Nawaeb, John Rosso (Independent) is leading in Lae Open and Ginson Soanu (Pangu) is leading in Morobe Regional. PNC Party leader Prime Minister Peter O’Neill expressed disappointment at the way things turned out but he said these were the people’s choice and that the election has been a true reflection of the people’s choices. “We have lost some good members, but we are also winning some new blood into our party as well,” O’Neill said. Zeming in a statement last night conceded defeat and thanked the people of Tewae-Siassi for allowing him to serve them in Parliament for four terms. He first entered Parliament in a by-election in 1995, following the death of his brother Soling Zeming. He was re-elected to Parliament in 1997, 2002, and 2012. “I thought I stood on a strong record of delivery, in improving transport infrastructure for my people, upgrading school facilities, providing free education for our children, and enhancing agriculture and small business opportunities for my people, to be given an opportunity to represent them for a fifth term. Zeming said instances of voter fraud and illegal acts were brought up during polling and counting, and allegations will be looked at closely in the coming days. “I want to call on my supporters in the district to remain calm and not take the law into their own hands. Violence achieves nothing. If there is credible evidence, we will address them through the proper lawful process,” he said.